A few weeks ago, the pool opened on weekends. 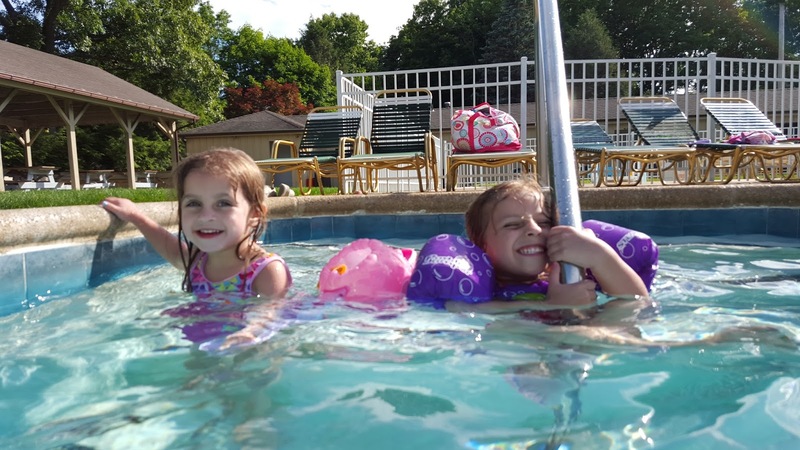 I wrote about how I was concerned about Reagan and how I'd have to push her, most likely kicking and screaming, into the big pool and swim lessons. But darn it, I was taking a stand. The next day she went in, tentatively and clinging to me like a baby koala, wanting me to stay near the steps, just like Madison used to. No one but Mommy would do. Then, a lightbulb went on and she realized it was fun. And we haven't stopped her since. No, seriously, we can't get her out of the "big cool" now. Sidenote: speech aside, calling it the "cool", instead of the "pool" is totally adorable and I have no intention of correcting her. She can make a /p/ sound so I'm not holding her back. This is just cute. And logical when you think about it. She hasn't taken swimming lessons yet, and even though she is a whopping thirty-seven inches tall, that still means that if she put her feet down in three foot area the only thing poking out will be the tippity top of her head. Which probably won't help anything. c) stay on the steps. Reagan strongly prefers B the majority of the time, but since one of my celebrations in graduating to the "big cool" was that I could actually sit on a lounge chair with the grown ups every once in a while. So while I will go in with her at least once or twice every time, I don't like to spend all my time being Reagan's personal "raceboat". So since she hates the floaty so much, if I'm taking a "cool" break, she's been content with C. She knows she can't touch the bottom and she's not really a water daredevil. The older one with swimming lessons, who can touch the bottom, is wearing a floaty like a security blanket. The younger one, with zero swimming instruction, is not. That makes sense. Well, this past weekend I realized that it's a darn good thing that lessons start this week. Because this kid's confidence is high. I'd been in with her, but I'd gotten out to do something with Madison, and I was drying off on a lounge chair while she played on the steps with a few of her friends. I reminded her a few times to stay there. I looked up a few minutes later and she was halfway across the pool. OK, that sounds dramatic. She had scooted over to the wall from the steps, and, holding onto the wall, was making her way around the entire shallow end. No fear, no remorse, just pride that she was doing it! All by herself! I scooped her out and put her floaty on, and she went right back in and completed a full lap of the entire shallow end, hanging onto the wall, complaining the entire time about how her floaty was getting in her way. Long story short, be careful what you wish for. All I wanted was for two kids to be willing to take lessons. What I got was a little fish who waits until I'm not looking to scare me. It might be a long summer.